Combines effects from other nodes such as Volume Absorption, Volume Scatter, Emission shader and Blackbody emission into a single node for easy rendering of smoke and fire. The volume scattering colour, as in the Volume Scatter node. The density of the volume. Skews the angle of the scattered light and alters the appearance. The values range from -1.0 to 1.0. Negative values skew the reflection in a different direction to positive ones. 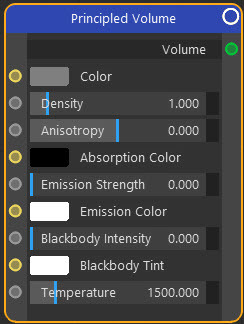 The colour of the volume shadow. This is the strength of the light emitted by the volume. The colour of the emitted light. This is a special blackbody emission setting for rendering fire. Ranges from 0 to 1; set to 1 for most accurate results. Additional colour tint for blackbody emission. If set to white it has no effect. The temperature in degrees Kelvin for blackbody emission (as in the Blackbody node).